Forced Response: After you succeed at a story to which Wilbu Whateley was committed, place a success token on Wilbur Whateley. 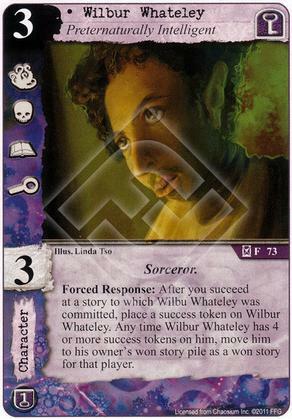 Any time Wilbur Whateley has 4 or more success tokens on him, move him to his owner's won story pile as a won story for that player. Is he losing the tokens when he goes insane?? What happens to success tokens that are on Silver Twilight Collector when this character goes insane? Do they get discarded or do they stay on the card? After a character goes insane it loses any tokens placed on it or any cards attached to it. When a character with 1 or more wound tokens goes insane it is immediately destroyed. I hope that they have clarified in the FAQ that it should say Wilbur and not Wilbu in the forced response? Has anyone had much success with this one? Leaves me wondering if there's a way to skip a few turns and ramp him up quicker... Perhaps Aziz Chatuluka sac's to play Yog-Sothoth (TKATG) to use it's forced response to put some tokens on Wilbur? I have come to not really like the 1-of-each-icon characters. It seems efficient but really you're still vulnerable to losing struggles to 2-cost guys with 2 icons. So I love ol' "Wilbu" and I totally disagree with the 1-of-each-icon guys being bad. In the case of Wilbur here you're getting great economy with 4 icons/3 skill for 3 cost. Oft times that 2 cost 2 combat guy that would theoretically beat you doesn't have willpower to handle the terror. Add to that this is a very playable card inside a mythos faction that has an investigation icon and not much drawback and I think he's even better. His ability is kind of "meh" since getting him to 4 tokens is a bit of a chore, but I have had it go off before. All in all, I think he's a solidly decent body with investigation inside a mythos faction with an interesting (if not efficient) ability. He's outshined by The Claret Knight and Decendant of Eibon for his role in a deck, but I still have a soft spot for him. His stats are okay for the cost, but the ability is rather useless due to being too slow. It would be cool if you could use Yog from 'the Key and the Gate' to put some extra tokens on him, but alas, he'd be put under your deck before he could trigger his ability. Being a Sorcerer is something, it seems like we're getting some synergy for that these days, and his icons are pretty good for 3-cost. He could get amazing at any time if a new card comes out that lets you put a success token on a non-story card like some sort of Fated countermeasure. Couldn't you also speed him up with Summon Specral Hunter? It would destroy him after the third token, since he only has three skill. Now, if he had an Expensive Guitar to boot, that would be cool, but the three-card combo seems like a might tall order.